Beyond AIDS is a non-partisan national organization committed to more effective control and prevention of the national and global spread of HIV/AIDS. We are unique, in focusing on improving public health policy to stop HIV transmission as our primary mission. We believe that this can be achieved by effectively applying proven public health measures, such as reporting, partner notification, universal screening, and intensive work with infected persons to encourage them to participate in effective treatment, and to motivate and assist them to avoid transmission to others. Now that antiretroviral treatment has been proven capable of suppressing the virus so that it will not spread, treatment (if started early and maintained with faithful adherence) is truly prevention. Conversely, prevention is truly part of care and treatment. All of these and other techniques have been successfully utilized for other diseases for decades, but have been underutilized for HIV up to now for political and historical reasons. In fact, during our first decade as an organization, many traditional AIDS organizations spent considerable donated resources lobbying AGAINST the very changes we believe are scientifically necessary to control HIV. 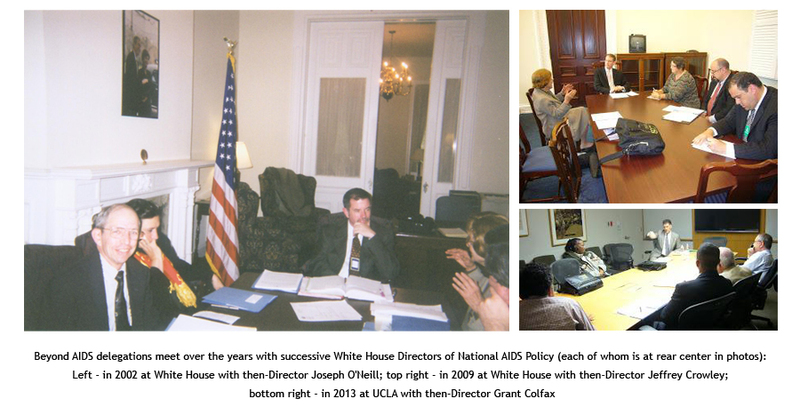 Fortunately, many of the positions of Beyond AIDS have been gaining acceptance in recent years as national policy, and are finding increased acceptance by HIV/AIDS clinics and organizations, but others will need continued and intensified efforts to achieve adoption. Beyond AIDS looks forward to a world "beyond AIDS," in which the HIV epidemic is on a downward course and attention can be redirected to other neglected public health problems. While this once was only a dream, it now appears feasible. Beyond AIDS advocates a balance between rights and responsibilities, and between risk avoidance and harm reduction, in protecting the lives and health of the human population. And while the struggle against HIV/AIDS epidemic is exceptional, Beyond AIDS opposes making it an exception to public health. The organization also focuses attention on other neglected or emerging communicable disease threats for which adequate strategies have not yet been developed and funded, particularly those that spread in ways similar to HIV, such as hepatitis C. We suggest that screening and education for other bloodborne and sexually transmitted infections might be cost-effectively coordinated with similar efforts for HIV/AIDS. 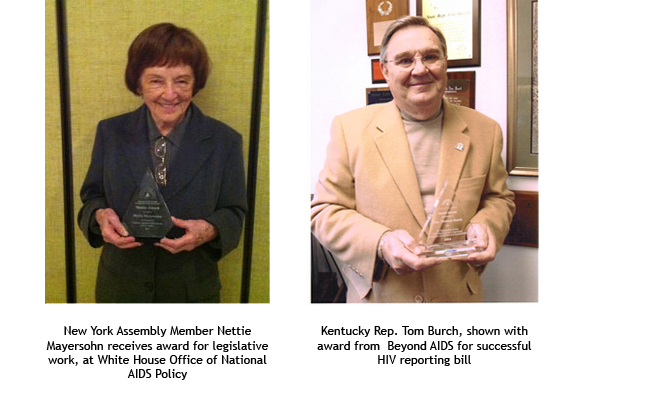 Our membership organization, Beyond AIDS, works to change laws and regulations to improve public policy on HIV, at the state, federal, and international levels. Membership in Beyond AIDS is open to anyone who shares these goals. Although Beyond AIDS functions primarily as a national American organization, international members are welcome, and attention is increasingly global in scope. Beyond AIDS was founded in 1998 and incorporated in 1999. It is recognized by the IRS as a 501(c)4 organization (the category for civic leagues and social welfare organizations). It is a membership organization, and can legally work to promote legislation in support of its mission. Our tax-deductible Beyond AIDS Foundation, in contrast, is a 501(c)3 organization, devoted to education of public officials, health professionals, and the general public, as well as research, and supports our internship/fellowship program. The Board that operates the Foundation is designated by Beyond AIDS. See tax information below. Both are registered in Virginia as nonprofit corporations. To contribute to either or both, please click on Make a Donation. Fill out and submit a membership/donation form. This provides options to join our membership organization, make a donation for political work (non-deductible), and/or make a tax-deductible donation to the Beyond AIDS Foundation. E-mail a message of interest or questions, to info@beyondaids.org. Beyond AIDS, Inc. is a nonprofit Section 501(c)4 organization, with EIN 54-1957919. It is tax-exempt, but not tax-deductible; therefore dues and donations cannot be deducted for tax purposes. That status allows funds are used in part for legislative action. It is incorporated in Virginia. The Beyond AIDS Foundation is a 501(c)3 organization founded for education and research purposes in 2001, with EIN 54-2017450. Contributions are tax-deductible. It, too, is incorporated in Virginia. Despite its name, the Beyond AIDS Foundation is recognized as a private charity and is neither a Section 509 grantor nor classified as a private foundation by the IRS. It is not independently endowed at this time, but depends on donations to fund its work.